Occitan (English: /ˈɒksɪˌtæn/; French pronunciation: ​[ɔk.si'tɑ̃]; Occitan: [utsiˈta]), known also as Lenga d'òc by its native speakers (Occitan: [ˈleŋɡɔ ˈðɔ(k)]; French: Langue d'oc), is a Romance language spoken in southern France, Italy's Occitan Valleys, Monaco, and Catalonia's Val d'Aran: the regions sometimes known unofficially as Occitania. The Occitan language took a different path from Latin than any of the official languages in the countries mentioned above. It is sometimes called Lenga d'òc (language of "Oc", French: Langue d'oc) because the word for yes is òc, as opposed to oil (oui) or sì in other languages. Latin had no word for yes, and this is one way to distinguish among Romance languages. Some of these dialect names were used in the past to name the whole language (Provençal, Limousin, Gascon). ↑ "Page d'accueil". Région Nouvelle-Aquitaine - Aquitaine Limousin Poitou-Charentes. ↑ "Reconeishença der Institut d'Estudis Aranesi coma academia e autoritat lingüistica der occitan, aranés en Aran - Conselh Generau d'Aran". www.conselharan.org. ↑ Hammarström, Harald; Forkel, Robert; Haspelmath, Martin, eds. (2017). "Occitan". Glottolog 3.0. Jena, Germany: Max Planck Institute for the Science of Human History. ↑ Oxford Advanced Learner's Dictionary, 7th edition, 2005. 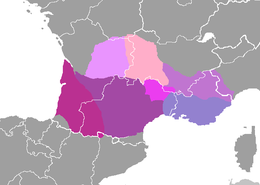 ↑ Regional pronunciations: occitan = [u(t)siˈtaⁿ, u(t)siˈtɔ, ukʃiˈtɔ]. (French) Eonet.ne, "LexRomEdic", Electronic version of Lexique Roman of Rainouard (A provisional version is available). This page was last changed on 10 July 2018, at 13:40.